Minister of Transportation, Rotimi Ameachi in an interview with Vanguard revealed how embezzled money was unconsciously circulated within the country, he also went on to reveal how Nigerian Politicians committed Manslaughter. When asked, WHAT is the future of APC in 2019? I am not God and only God can say whether APC will win or not but what is clear is that if you remove the God element, I think we are prepared to go because Nigerians will certainly reject a second looting, we cannot survive it. Sixty per cent of the rich depend on the government; so only three years that they removed their mouth from the breast milk everybody is complaining. If I steal maybe a $100,000 from my ministry and give to you, you will say ‘oh, Ameachi is the most generous minister’ but you didn’t ask me where I got it from. Now, you go home and give $50,000 to your wife and she takes $20,000 and gives to her mother, her mother goes to the market buys egusi and the woman she bought egusi from pays school fees, the person he pays school fees repairs his door, the carpenter that fixes the door, takes money to buy uniform for his child, the tailor that sews the uniform pays for a burial. You see how the economy runs and that is the economy of Nigeria and we are saying it just cannot continue, the economy has to be productive; that is what the president is saying. 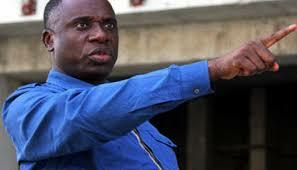 Amaechi who has again been appointed as President Muhammadu Buhari’s campaign manager in the course of the historic train ride between Itakpe to Warri, penultimate weekend, addressed several challenges in an interview. He spoke on the challenges of the administration arising from the spate of defections from the ruling All Progressives Congress, APC, assesses the achievements of the administration and talks about his enthusiasm and efforts to make Nigerians enjoy modern railway services. WHAT is the future of APC in 2019? If you want to have access to the national economy, to the national treasury then everybody should have that access, it should not be where only few of us who have access to it should loot the economy of Nigeria. Even those that criticise me in Rivers State will tell you that I have a good reputation. I ask people ‘what do I need money for?’ I don’t smoke, I don’t drink, I am not the one with luxurious houses and cars and it is like what I said when I became governor, I said Nigerian politicians actually commit what they call manslaughter, which is killing by accident, when you don’t have intention to kill. How do we politicians kill by accident? The money that is meant for the people and earmarked to be used for building hospitals, you take it for your private use and the hospitals are not built and so Nigerians go to hospitals where there are no drugs and they die without knowing it. For me, you have committed manslaughter and the problem for me is that Nigerians don’t hold us accountable! Has it been a success story for you in the Ministry of Transportation? It has not been bad, it has been challenging but I am glad with the calibre of workers and my colleagues in the ministry; they have been understanding, we have disciplined ourselves a bit. I have been told by some contractors that it wasn’t like that in the past, that they come to work by 1:00 p.m. and close by 2:00 p.m. In fact, we had a management meeting last week where we said no management staff, apart from the minister, should come to work any time later than 8:30am. The minister is only exempted because of the political role I play as the D-G because I told them that in the next few weeks, I will be focusing on politics, I will be doing the job of a DG. While I will run the ministry, I expect to be interfacing with the permanent secretary. The second thing we dealt with is to provide buses for the junior staff because we felt that they don’t have enough money. The key to me is that in the Ministry of Transportation, we were able to curtail corruption because I also heard that it is one place nobody wanted to come to. Take NIMASA for instance, I am sure that if they know what we have done in NIMASA, nobody would want to be the DG of NIMASA again because NIMASA no longer awards contracts. I insisted on that and that is why I said I won’t pay anybody; if you got contract from NIMASA, go and look for your money because that wasn’t the job of NIMASA, the responsibility of NIMASA is that it is a regulatory agency. We have streamlined that. NIMASA now pays money to the Federal Government, it paid N22 billion last year, the NPA has cleared all the debts they owed the Federal Government and they are paying the current one. NRC may not be doing that now because NRC is constructing but we intend to break NRC into three other companies, that is where our attention is now and we are working on that. One to manage the track, the second one to operate and the third one marketing; so we don’t have one company that is doing everything and not able to operate. Well, I am going ahead, if it is not against the law, then we can put it into the amendment bill but you need to do that because that is what it is virtually everywhere else. It is so in South Africa, Britain and other places. So how soon should we expect this unbundling? There are those who are doing the paper work and when they finish, I will meet with the management, then I will go the president, then to the cabinet and then to the National Assembly. Has your ministry done enough to sell the President for 2019? Do Nigerians actually care about projects? First thing that is always in the mind of every Nigerian is how to feed; and the president is not doing this because he wants them to re-elect him, he wants to satisfy himself. If you have been to Cape Town, and you see the infrastructure there, you will be proud to be a South African. And that is the question the president is asking that all those times when a barrel of crude oil was $110/$120, what did we do with the money? And that is why when all these people come together and say they want to fight us, I ask the question, have Nigerians forgotten so easily that we had money all this while and how much have we put in these projects? By now, imagine the suffering you would have removed from Warri and don’t forget that this project even terminates at the Warri seaport. What people think about most of the time is about their income but what this project does is that it creates employment. The president has two targets; he promised the people that he will create employment and this is one way of creating employment. When we finish, we will employ people that will man this train, employ those that will maintain it. I was just talking to the MD (Nigeria Railway Corporation) and he told me about those who work on the track. For Kaduna-Abuja line, we employed about 300 persons whose job is just to work on the track for maintenance purposes. Now imagine for over 300 kilometers of rail, the number of persons that will be employed just to work on the track! Imagine the fact that there are stations to be manned, imagine that there will be staff that will work inside the coaches and locomotive drivers, conductors, somebody will get the contract of maintaining the train and all that. So for the president, it is about the economy, it is about creating jobs, it is about ensuring that money is put in the hands of Nigerians. It has been there for a long time, this project would have been costlier, it would have been more than $3 billion. Abuja-Kaduna line celebrated two years last week, what is the success? We have done two years, what is your assessment of us on the Abuja-Kaduna line? Have we done well or have we done badly? The first thing that I did was to make sure the transport fare was low and I did it deliberately and people began to beg me to increase it, the passengers were begging me to increase the fare and we increased it but I didn’t increase it to the amount they asked me to, I kept it at something that people can pay. Somebody sent me a text that people are standing, the reason people are standing is because it is the cheapest form of transportation. As at the time we increased the fare, we were paying N56 million per month, and getting only N16 million so we were subsidising both rich and poor with N40 million as at that time. There are about four locomotives now and I need to check how much we are putting into it and how much we are getting out of it but what has happened with the increase in the fare is that we are trying to break even. Those who use it say we are prompt because I remember the number of times I have missed that train because they refused to hold it for me because I am a minister! Once it is 8, it is 8 whether minister is coming or not, they will go! So we have been prompt, we have ensured cleanness and we have kept the fare low, so we have shown that there is nothing wrong with the black man. There is nothing like international standard, we can meet any standard if we focus on it. It is not being managed by white men or CCECC, it is being managed by the NRC. So how much has been spent on the Abuja-Kaduna line? In total, it will come down to a billion dollars. The Chinese government gave us $500 million and we are giving $500 million. We awarded a contract for $500 million for coaches. Actually, the China-Exim Bank was ready to give us the money but the president turned it down and said we should fund it ourselves and we started from the $500 million to buy locomotives, coaches, etc. What is the update on the contract with CCECC to build the Ibadan-Kaduna line? We have signed the contract but we have not gotten the loan. What is key is the loan and that is a bit difficult for us but we are pushing hard to get the loan and if we get it, they will start this year. With all these projects, is the ministry not overwhelmed; why not finish one project before going to another? Are we not completing them? Tell me which one we are not completing? That one we should be able to finish latest January. I think you should be praising the ministry because we are able to multi-task. We met this dead on arrival and we are completing it and our initial target was to leave site in June (2018) and if you listen to Julius Berger, they say they are leaving site at the end of August; CCECC is where we are having problems, they are trying to say this contract is till 2019 but we are insisting that they must complete it. Imagine the commercial activities that will create jobs. For the first time, the Lagos governor was saying please stop exporting and importing from Lagos, use other seaports and when I asked him why, he said it is destroying their roads and other infrastructure. So the pressure on the roads will be reduced as soon as this is on; those people will stop using the roads, even those who transport goods to the south, they can just come to Lokoja and just put their goods on the track and end up here in Warri. What impact will this make on politics? I have been a politician for 32 years, what impact would this make? What is your maintenance plan after the completion of this project? We had an agreement with CCECC to maintain for three years and we have introduced two programmes. We are taking Nigerians to China for five years to study different forms of engineering on railway. Then we are also compelling CCECC to build a university in Katsina, a transport university and the reason for that is to train engineers that can get us up on railway activities, so that they can do maintenance and all that. You made a case for an extension to Lokoja; have you given any firm commitment to the contractor? It is a long process, you have to go to the president to convince him that I just have 25km to get to Lokoja, why do I have to wait if I can get to Lokoja in 25kms and I evaluated the cost and if he says yes, we will look at the cost, bring the cost to him and I don’t think it should cost more than $100 million and that is about N36 billion. Now, if we get the N36 billion and we get to Lokoja, we have solved a lot of problems in terms of transportation and you have helped those coming from Warri to get to Lokoja and find easier transport to Abuja than the way it is now. How are the states being carried along in all these activities? They are all federal projects and it is when we get to your state and we have a problem that we will talk to you. Like the Ogun State governor, he promised to do the road from Abeokuta to where we will build the station which is about six kilometers. The Lagos governor is doing his best in terms of making some contributions. Some governors are doing something, it depends on how much you have; don’t forget that Kogi State is not that rich and whatever we can do to get to Lokoja, government will do it.